VATICAN CITY (CNS) — Catholic universities need to study the root causes of forced migration and ways to counter the discrimination and xenophobic reactions it provokes in so many traditionally Christian nations, Pope Francis said. “I would also like to invite Catholic universities to teach their students, some of whom will become leaders in politics, business and culture, a careful reading of the phenomenon of migration from the point of view of justice, global co-responsibility and communion in cultural diversity,” he said. 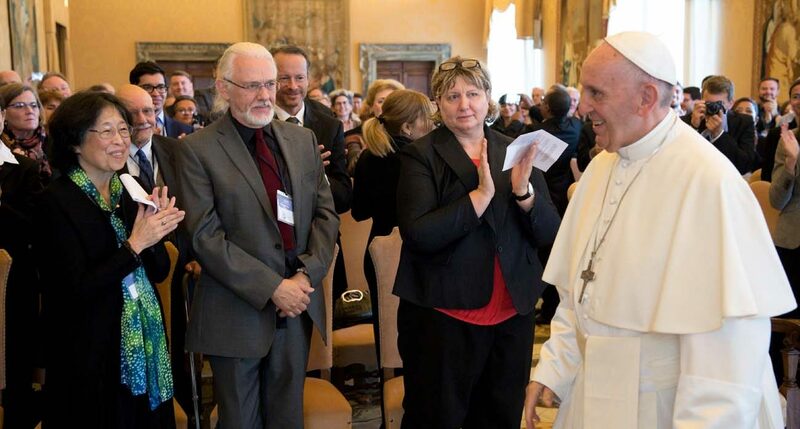 Pope Francis praised the organization’s efforts in the fields of research, formation and promoting social justice. He called for more study “on the remote causes of forced migrations with the aim of finding practical solutions” because people have a right to not be forced to leave their homes. “It is also important to reflect on the basic negative — sometimes even discriminatory and xenophobic — reactions that the welcoming of migrants is provoking in countries with a long-standing Christian tradition” in order to develop programs and ways to better form consciences, he said.